St. Petersburg - So close, yet so far for those of us who are from Finland! At this time of the year, I often think that it would be nice to visit St. Petersburg in Russia again. For Finnish people, St. Petersburg is practically a few hours away, but still many people have not visited. Many might fear the visa process. But if it is too hard to get a visa, you can always go on a visa-free cruise like we did. When you arrive in Russia by ferry, you are allowed to stay on shore for 72 hours without a visa. Even in that time, you will get to see plenty of things. The sun has finally returned after the dark and cold winter, and will warm up not only the air, but also people’s hearts. The locals will get out to enjoy the spring time too. The snow has just melted and the sun will make the golden cupolas of the the churches shine even more than they normally do. But the best part is, that it is not too hot to tour around the city even by walking. The evening in fact, can be a little chilly, but the days can be quite beautiful. In the summer time St. Petersburg is full of tourists, and the prices go up. During the spring you are likely to get your tickets cheaper, like the hotels and other services too. So if you want to save a little money for your future travels, offseason is the time to go. Again one good reason to visit St. Petersburg during springtime. No crowded places, no lines! You can access even the famous Hermitage Museum or the Church of the Savior on Spilled Blood within ten minutes wait, and there is space to walk around and take photos without other people being in them. This is true luxury! Just don’t forget that most of the museums and churches are closed on Mondays. 5 reasons to visit St. Peterburg in Russia during the spring, and this is one of them: The State Hermitage Museum. Before Easter you will find so many beautiful decorations and hand painted wooden Easter eggs sold on the streets and stores. Easter is a big celebration in the orthodox church, and it is seen in many ways in Russia. I really liked the decorative eggs they were selling and bought some to bring back home to California. Springtime in St. Petersburg is full of all kinds of events. Many of them are related to Easter, but there are also other celebrations and many concerts that are held during the spring months. If you like to see local traditions or enjoy different kinds of festivals, spring is the best time for that in St. Petersburg. St. Petersburg is an amazing city with so much to see! It is a paradise for those who are into history and historical buildings. And wow, there is so much gold in abundance in those places. Unfortunately, there is also another side of St. Peterburg. Most of the local people don’t live that way themselves. 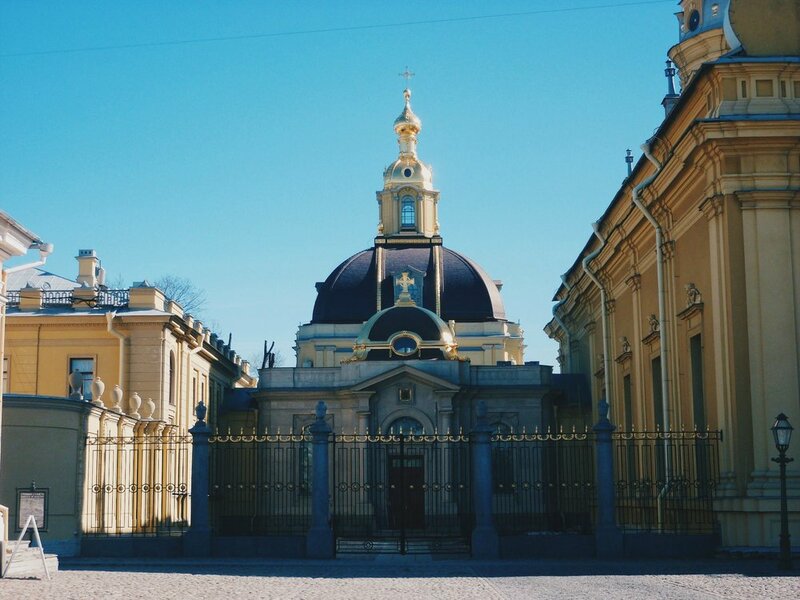 There are many faces of St. Petersburg, and it is definitely at it’s best at the spring! Two weeks ago we did a trip to Napa Valley which I already told about you on my last post. We went to view wineries, ate well and enjoyed the mineral pools at our hotel spa. The first winery we visited was Sterling Vineyardsille which right by the city of Calistoga. While driving over the sun came out and the spring day could have not been more prettier. Sterling Vineyards was started in 1964 by an Englishman Peter Newton. He visited California and fell in love with the beauty and wines of Napa Valley and decided to invest in his own vineyard. Later he purchased more land from close by and built a winery building at the top of the mountain hill at the premises. The building got its inspiration from a Greek island Mykonos where Newton used to also live. Winery was first opened to public in 1972. At some point Newton bought an old church bell from England and brought it with him to the vineyard. The bells originally belonged to St. Dunstan Church which got destroyed in the World War II and was located in London. Today the bells are in use, and they ring in every 15 minutes. At this point I have to admit though, that while our visit to Sterling I didn’t hear or notice the bells, so they must not be very loud. 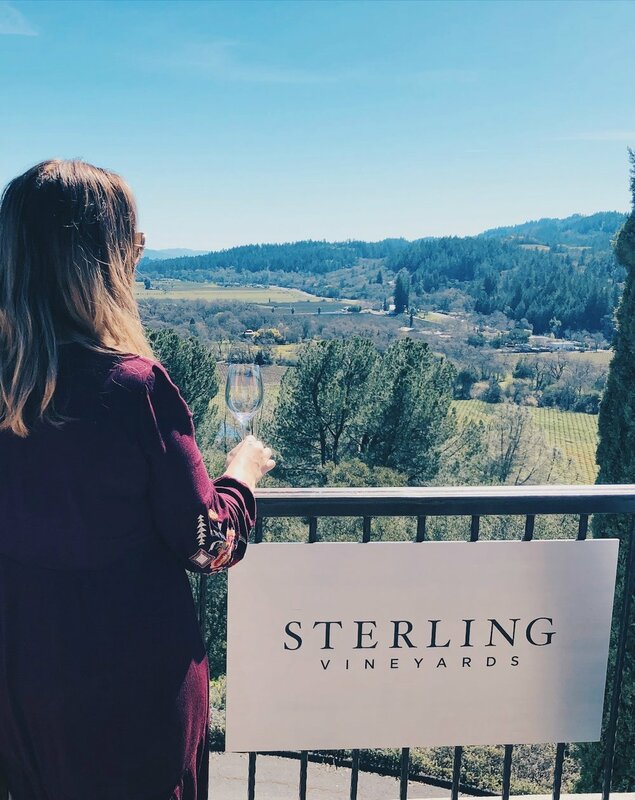 Sterling Vineyards produces Sauvignon Blanc, Chardonnay, Merlot, Cabernet Sauvignon, Pinot Noir, Zinfandel and Shiraz. One of the biggest achievements for Sterling must of been the win at Ottawa Wine Tasting in 1981. Their wines were also used at 2016 Annual Emmy Awards and 2017 Annual Screen Actors Guild Awards in Los Angeles. The vineyard have changed owners multiple times in the past, and one of the most interesting owners is the Coca-Cola Company. Today it is owned by a big alcohol company. From this winery I remember more the experience than their wines. Up to the winery you take a gondola that fits four people at the time. 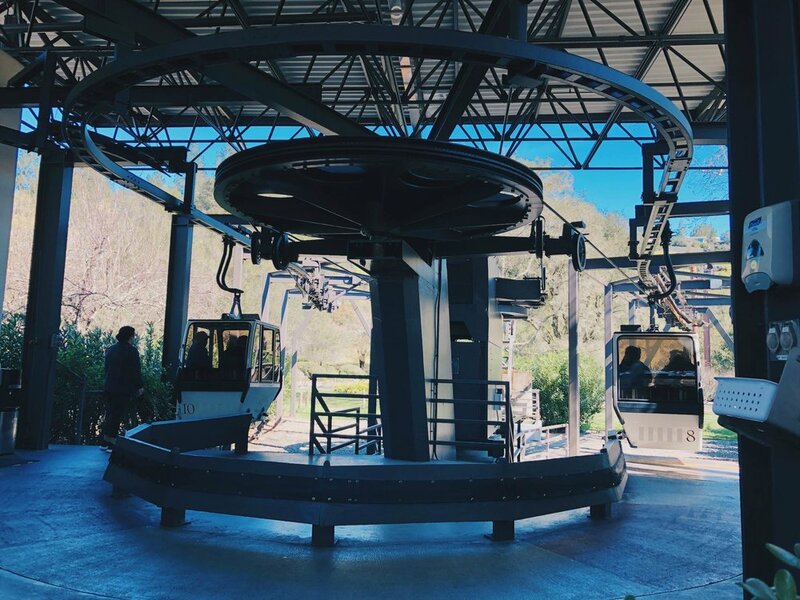 The views up at the mountain and from the gondola are of course great. Right after getting out of the gondola they have the first tasting spot and then you can start the self guided tour. You will walk through the winery tasting different wines in different rooms, and looking at the wine making videos from huge tv screens. The tour ended to a sun deck which had a beautiful view to the vineyard. Of course it would have been even more beautiful at summer or fall time since now the vines didn’t have any leaves. They also had a restaurant at the deck which you access by making a reservation. I have to say that the tour was really well organised and they had thought of everything when planning this. But it somehow was lacking some personal contact. Of course, if you pay more you can get a host for your group and better quality wines, but I thought that $35 for a wine tasting was already enough. They sure know how to commercialise everything in Napa Valley. After the tour you get to keep the wine glass as a souvenir. Just like other wineries, this too had all kinds of souvenir shops and other things. But for the first time I saw that some place is selling boxes of wines at the parking lot with discounted prices. After Sterling we continued to other wineries. This was truly an interesting start for our day at Napa Valley. It has been a long time since I have been Napa Valley, the most famous wine growing region of the United States. There are so many wine areas in California, and Napa Valley out of all of them, is by far the most expensive to visit. That might be why we don’t often go there even though it is only a couple hours drive from our home. This time we decided to do a little getaway weekend with my girlfriends, and combine a wine trip with a little spa retreat. And it was so worth it! It was great to have some time off from home and being a mom, and just be with friends enjoying the springtime sun. We left the San Francisco Bay Area in my friend’s van, and we had booked a driver for our group for a whole day in Napa Valley. She was already waiting for us when we arrived to our hotel in the town of Calistoga. She’d made us some reservations to four different wineries and so we headed to our wine tour. 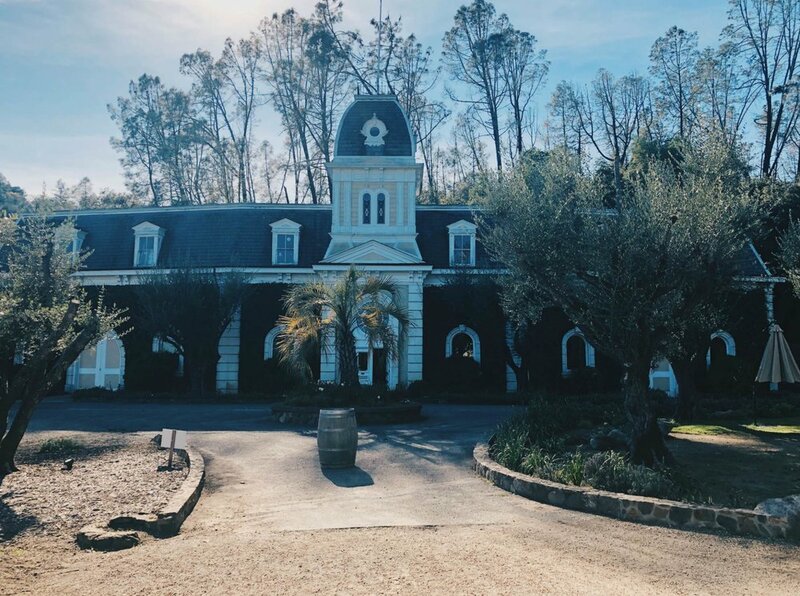 My favourite places in Napa Valley are absolutely both Calistoga and St Helen where they have many nice wineries and spas. Since it is a volcanically active area, many spa hotels use the mineral water from the hot springs at their pools. They usually also offer many kind of treatments like mud baths. We started our tour from Sterling Vineyards. I actually wasn’t so excited after seeing their website, since it seemed to be showing only millenials partying in their night club clothes rather than the wine. But our driver assured me that this would be a nice place to visit…and it was. The wines didn’t really strike me well, but people are taken up the hill to the winery in a gondola and the views are great of course. Like so many other wineries in Napa Valley, you are paying for the experience rather than the tasting itself. The tasting included a self guided tour at the winery, gondola ride and a wine glass to take home. At our next winery, Frank Family Vineyards, we had planned a picnic lunch. Before leaving on the tour, we stopped at a little market in downtown Calistoga and got some salads and sandwiches. Our driver Linda was well prepared for this too; she had brought a picnic basket with plates and everything. From the winery we bought a couple bottles of bubbly for the lunch and enjoyed their picnic area outside. So we didn’t actually try their tasting menu, but the wines we chose for the lunch were excellent. After our picnic lunch we headed to the third winery which actually has a long history in Napa Valley. There are two reasons why this vineyard is important to Napa. Some of you might have heard of the so-called Judgement of Paris in 1976. It was a wine tasting contest organised in France and done blind folded. To everyone’s surprise, a wine from Napa Valley won. Normally the French were kind of laughing at Americans and their wines, but now they had to admit that there was something better than French wines. The winning wine was from a winery called Chateau Montalena which still exists in Calistoga, and where we have visited earlier. In that same competition, fourth place went to another wine from Napa Valley called Spring Mountain Vineyards. And that is where we headed next. Another reason why this winery is known, is a television show from the 80’s called Falcon Crest. It was filmed here and even the main house from the show is at the vineyard. Spring Mountain is a very private and calm place, and they only take a handful of visitors who have made a reservation beforehand. And the wines? Amazing! But also very pricey. Many of them can only be bought straight from the winery. Mumm Napa, the last place we visited, ended up being a waste of time. Not because it was bad, but because we were late from our schedule and they had given our table away. Wineries in Napa close early—around 4 or 5 pm—and we wanted to get to the hotel anyway before our dinner reservation, so even though we could have waited to get another table, we decided to head out. I didn’t mind so much, because I have visited it many times. Mumm Napa is very popular among the visitors and I recommend making a reservation if you plan to go there. I will tell you about all these wineries more later. There are many small, nice restaurants in downtown Calistoga. We actually voted about where to go, and a French restaurant “Veraison” won. It was a great choice. Nothing extra special, but the food was good and they paired everything with wine of course. I went with the chef’s menu which had Osso Bucco as a main course. The next day before heading home we also had a brunch at Sam’s Social Club which had a great outside patio. After bathing and swimming, the avocado toast with mimosa was to die for. If you are staying the night in Calistoga, you should absolutely choose one of the spa hotels, so you can try out the warm mineral pools. This time our hotel had two saunas: a dry sauna and a steaming one. From the sauna, we ran to the pool area, where the water comes from the warm springs in Calistoga. The hot tub was way too hot for me in the sun, but I did enjoy the actual mineral water pool. The water looks a little different from the regular pool water, but they do say that it can be a different color at different times of the year. Some hotels also offer mud baths with volcanic mud or other treatments. Last time we did try the mud bath and it was a fun experience. When we left back home, we stopped in the city of Napa to visit the Oxbow Public Market. It’s a market place where local producers sell their products, food and wines. It was a great place to buy something to take home with you. This kind of weekend more please! What is your best getaway weekend activity? Few weeks ago we celebrated the Chinese New Year in Chinatown San Francisco. Before the main event of the evening; New Year Parade, we went to eat some Chinese food. Here when you finish eating in a Chinese restaurant, you usually get a little fortune cookie for dessert. We had planned to visit also the Golden Gate Fortune Cookie Factory on the same day, so before heading to the parade area, we stopped at this cute little place. I had never thought about it, but the fortune cookies are actually an american thing and most likely, you wont run into the in Asia. No one knows for sure where they originate from, but many believe that they came to America with the Japanese immigrants in 19th, or early 20th century. You can actually still find a cookie a little bit similar to this to be sold in Kyoto, Japan. Some say a Japanese man called Magoto Hagiwara was the first person to offer these cookies to people in the Japanese Tea Garden located in San Francisco’s Golden Gate Park. Few others have also claimed to be the inventors of the fortune cookie, but no one has been able to prove it true. Fortune cookies are made from flour, sugar and sesame oil, and flavoured with vanilla. Originally all the cookies were made by hand but the cookie production got a lot faster when a fortune cookie machine was invented in Oakland, California. Inside the cookie there is a little note with a Chinese phrase or an aphorism, and often some lottery numbers as well. When we arrived to the Fortune Cookie Factory we almost turned away after seeing the line. We soon noticed though that it moved very fast, and decided to stay. The reason the line moves so fast is because the factory is actually very small, tiny in fact, and it only takes couple minutes to tour it around. You will see how couple staff members make fortune cookies, and you can buy cookies to take home with you. Among the traditional fortune cookie, there are also some other flavours and fortune cookies covered with chocolate, and even some giant cookies. You can even add your own note inside a cookie. Wouldn’t that be a great hint to someone who is planning to propose? We followed the line inside and bought some chocolate covered fortune cookies to take home with us. Even though the line moved promptly, we had some time to snap couple of photos from inside too. From people who want take photos, they ask either a 50 cent donation or to purchase something from the factory. Fortune Cookie Factory was opened in 1962 and it is owned by Franklin Yee. They produce about 10 000 cookies a day. About a week after visiting the Golden Gate Fortune Cookie Factory I saw in the news that they might have to close their doors soon. San Francisco’s absurd rent prices are really killing the small businesses. It would such a shame if the fortune cookie factory would be gone since it truly is a piece of Chinatown’s history and a great little place to visit! Well here we go, it is the start of the Year of the Pig! Or to be even more specific, the Year of the brown pig. For some years now I have tried to make it down to the Chinatown in San Francisco, to see the New Year Parade but there has always been some excuses; rain, sick kids and or something. But finally this year I was able to experience this amazing night. Even though it was a chilly evening, we had a lot of fun listening the fire crackers and watching the parade. If you want to see how it was, just check out my Instastories on my Instagram account. Chinatown in San Francisco was established in 1848, and it is one of the top sights to see among the tourists visiting the city. Almost 35 000 people live over there and it is the most densely populated area after Manhattan. During the history, the Chinatown has seen many thing from earthquakes to confrontations of some Asian gangs. Many Chinese living close by come over to Chinatown for shopping and to different events, the tourist come to see the sights and to eat. While walking on the small alleys of Chinatown you can easily forget that you are in the USA and you are likely to hear more Chinese than English. It is definitely a worth of visit when in San Francisco. Every year couple weeks after the new year starts they organise a big parade in the Chinatown. At the dawn people gather up along the roads to wait and you can start hearing the fire crackers. If you want to get a front row spot, you have arrive at least an hour before the parade starts. And it goes on for several hours. It end by the tent of the judges who then choose the best performer or float. The parade is a mixture of Chinese traditions and American parade culture. The whole thing started with a police entourage which then continued with other participants. Since it is a year of the pig, all the decorations of course where made to showcase that. Chinese traditions were the many lion and dragon dancers, martial art performers and other dancers. I think the America was represented by the marching bands and the floats. I especially remember the big dragons and the decorated cable cars which this time were on tires. The first parade was held already on 1858, but there are many other New Year events in Chinatown too. They have a New Year Run, Miss Chinatown U.S.A. pageant and even a flower festival. Miss Chinatown was part of the parade with her runner ups. The parade was actually so long that we decided to go get some hot tea and a bite to eat, and then head to home before it ended. We managed to see the end of the parade while walking toward to train station. Even it being so cold, we still had to take some photos of the rest of the performers. The Grand Finale of the parade was the Golden Dragon. The dragon is made in China, and it is over 268 feet long. It need 100 men to carry it through the parade. And it truly was really magical when it danced very close of us almost touching our jackets. When we left home we decided that this was a good “practise year” for us. Next time we will come over with a bigger crew, will bring some lawn chairs, coffee and warmer clothes. Now we also know which spots are the best to watch the parade. The best ones are right after the bleacher seats where the performers will stop to do their routine. Or you can always get the seat with $35 and be guaranteed with a good view. Otherwise the parade is free of charge. This was truly a memorable experience! Happy New Year everyone!